General Motors and its bondholders have reached a deal that will allow the automaker to proceed with bankruptcy filings. The bondholders have been given a larger stake in the company, quelling their arguments of unfair treatment. Across the Atlantic in Germany, GM is also struggling to keep its European subsidiary Opel fiscally solvent. Overnight talks in Berlin failed to secure a buyer for Opel, and German ministers are placing the blame on GM and the US Treasury. Cinnamon Nippard has more from Germany. With 25,000 people employed by Opel in Germany, and thousands more across Europe, the German government is doing what it can to prevent Opel following what’s looks like impending bankruptcy for it’s parent company, General Motors. As well as holding talks with possible investors, including Fiat and Magna, the German government has also agreed to guarantee bridging loans to the tune of 1.5 billion euros – or $2.1 billion US dollars. However German Ministers came out of the negotiations this morning disappointed and shocked after General Motors asked for a further 415 million US dollars. German Finance Minister Peer Steinbrück was particularly scathing, saying that it would be too dangerous to dump more money into a deal that was “unsafe” to begin with. He said he couldn’t allow German taxpayers’ money to just flow directly into the American parent company. The negotiations will continue on Friday. Cinnamon Nippard, FSRN, Berlin. United Nations Aid Coordinator in New York says that the humanitarian situation has not changed much in Gaza since the war ended in January, mainly due to the continued Israeli blockade. Salim Rizvi reports. Maxwell Gaylard, the UN Coordinator for Humanitarian activities in the Occupied Palestinian Territories says Israel is only allowing about 10 percent of the required humanitarian aid to enter the Gaza strip. Only 120 of 1000 of the needed truckloads of aid have been allowed in. The UN aid coordinator says the one and a half million people are being punished collectively. Noted Haitian civil rights leader and former political prisoner Father Gerard Jean-Juste died yesterday at the age of 62. FSRN’s Ansel Herz has this remembrance. Father Gerard Jean-Juste WAS a Haitian Catholic priest often compared the Martin Luther King Jr. for his non-violent human rights activism. Jean-Juste died in a Miami hospital from stroke and lung problems, but just three years earlier he languished in a Haitian jail suffering from leukemia. The interim government of Haiti imprisoned him following the 2004 U.S.-backed coup against President Jean-Bertrand Aristide, for whom Jean-Juste was a prominent supporter. Amnesty International designated the priest a “prisoner of conscience” and Jean-Juste was released after 18 months in prison. Brian Concannon is the director of the Institute for justice and Democracy in Haiti and has worked closely with Father Jean-Juste. The Archdiocese in Miami released a statement saying, “He is to be remembered for his never-ending work with and for the poor both here in Miami and in Haiti.” Ansel Herz, FSRN, Austin. A group of 9 Los Angeles teachers are on hunger strike today to protest proposed layoffs in the district. The hunger strike follows weeks of student and teacher demonstrations over the Los Angeles Unified School District’s plans to lay off thousands of teachers due to massive budget shortfalls. The protesters want the district to use federal stimulus dollars to avoid lay-offs. They teachers say they will continue their hunger strike until a new budget is released, or the lay-offs take place. After a funding swing on the West Coast, President Obama returns to Washington, where he will meet with Palestinian President Mahmoud Abbas at the White House. The meeting is an effort to move along a stalled peace process. But new complications have arisen: Israel announced today it refuses to stop constructing settlement in the West Bank. FSRN’s Karen Miller has more. The work that journalists do is often daunting. Take radio reporters, for example: they have to interview a variety of sources, choose the best cuts and write around them in a compelling manner for their audience. From there, they record their own voice before combining all the audio elements into one neat package. Most reporters have had their equipment die on them at some point – but what happens when you can’t buy a new recorder, because there are no electronic stores in your region? Well, that’s what happened to our Gaza correspondent, Rami Almeghari. When his recorder quit working, FSRN tried to send him a new one – we found out it isn’t that easy to get ship anything into Gaza. In this reporter’s notebook, Almegari describes the trek one digital recorder went through in a long journey. 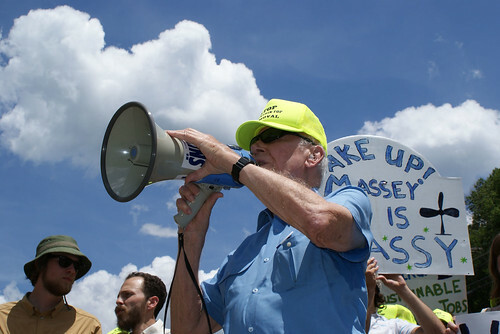 The campaign against Massey Energy’s mountaintop removal coal mining operations is picking up steam this summer. Last week, some 150 people took part in an action camp – 17 were arrested in civil disobedience actions protesting the controversial practice, which devastates mountain topography. In addition to the environmental concerns, activists say an accident could also kill hundreds in the community below the mine. Tanya Snyder reports from Pettus, West Virginia. In Rio de Janeiro, low-income favela, or shantytown, residents are coming to a compromise with their state government. The state was planning to construct walls around 13 favelas to prevent their expansion into the surrounding forests. Representatives from affected communities met with the state’s governor, and appear to have reached a mutually agreeable solution. Zoe Sullivan reports.